Font of the Month Club. Get new type in your inbox, every single month. Nameplate set in Pilot from Bold Monday and Aglet Slab from XYZ Type, served by Type Network. Kozei may be the most mentioned typeface on Twitter in 2014: 3200 tweets at minimum with no marketing department involved. All that attention, and yet most Typographica readers have probably never heard of it. Kozei is a Japanese calligraphic typeface for vertical setting, consisting of Hiragana with Nimbus Roman as a mandatory Latin placeholder. It started as a graduation project of Yukiko Uno, who tried to revive the style of mediaeval writing master Yukinari (aka Kozei) Fujiwara, breaking tradition of Japanese type design in the process by spacing glyphs proportionally and adding ligatures and contextual alternates. Adobe’s Kazuraki was the first to do this, and while it may not sound challenging to Latin readers, it is indeed a feat for Japanese fonts whose square monospacing is codified in industry standards (Adobe-Japan1, for example), and it is especially tough for independent developers. Kazuhiro Yamada receives credit for engineering. Japanese calligraphy at its mastery looks very irregular and misaligned yet in perfect control, which Kozei captures faithfully. You can almost feel the heartbeat and breath, a physical noise of the writer. The key feature of the typeface is the implied connection of the four variants of each letter. These positional variants are similar to Arabic, but they do not physically connect or overlap. The technique is called iren in Japanese calligraphy. You can break it at the end of a word, or perhaps in places where you would ink the brush. Kozei’s abundant set of ligatures adds another layer of stylistic richness. It shows how expressive Japanese typography can be, and how it has struck thousands of people including myself. Western designers may never have a chance to use it, but I hope they can still appreciate its delicacy and technical achievement. If you ask me, Kozei was the most beautiful typeface of the year, and a milestone to be remembered for the years to come. Toshi Omagari studied typeface design at Musashino Art University in Tokyo and the University of Reading. He specializes in various scripts including Greek, Cyrillic, Tibetan, Mongolian and Python, and works at Monotype in London. Toshi, you’re right. Kozei captures movements that are jazz to western pop. Elegant swooping curves are combined with energetic transitions and brush twists in a masterful way. This is one of the most impressive calling cards I’ve seen in a while. Thanks Gerry. It was hard to explain its spontaneous beauty but your jazz is a wonderful analogy. It is hard to logically explain what is happening but it is somehow making a beautiful rhythm. It was realised by the hidden pattern Uno found deep within Fujiwara’s works after painstaking research, her digitisation of the pattern but not just letters, and the engineer who could turn all that into a functional OpenType font (all happening outside big foundries I might add, which was apparently not seen before). Toshi, you beat me to it in choosing this typeface to review and actually it’s as well that you did, you being a Japanese speaker and so much more qualified. But one look at Kozei and even as someone with no knowledge of Japanese I saw something exceptional — the fluidity of technological possibility allied so perfectly to an understanding of the linguistic possibilities of the fluidity of the variant character forms. As such this typeface is not only enhancing typographic possibilities but seemingly extending them, which for me makes this work beyond exciting. Hi, I am currently looking at old Japanese texts, scrolls via a FutureLearn course in Rare Japanese Manuscripts run by Keio University in Tokyo. I also studied classical Japanese in the early ’90s. I purchased the font. It’s pretty amazing, but I have a question perhaps you can answer. In the single letters image, what are the columns after ba/bi/bu/be/bo? There are 9 columns, and it is the second from last which I was trying to find mainly (looks like ‘re’ but isn’t). I am looking forward to trying it out. 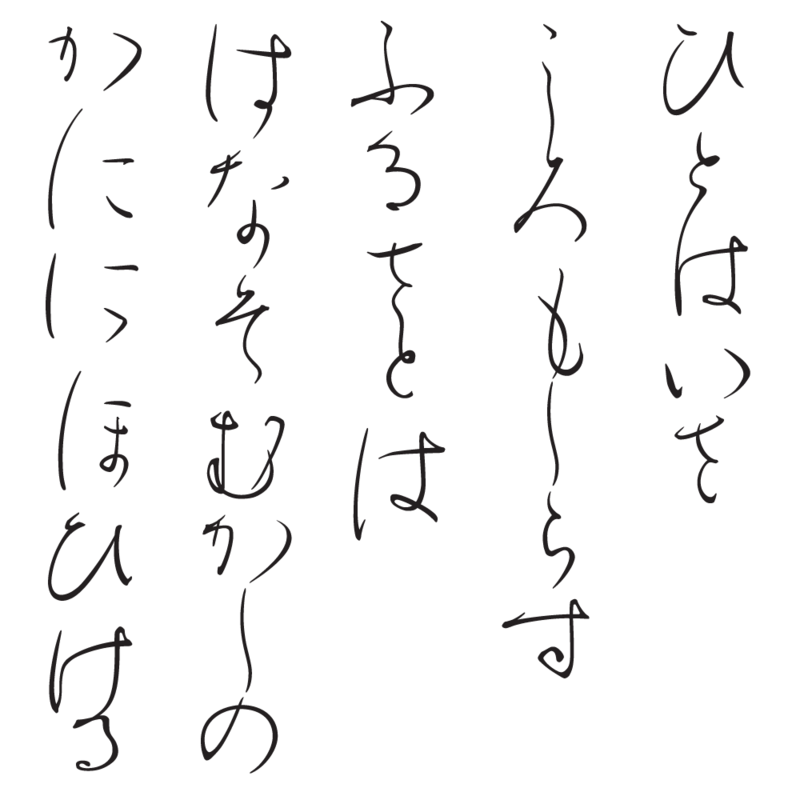 Those are hentaigana, variant kana letters that were abandoned in Meiji era for the sake of simplifying our character set by using only one letter per sound. They were made from other kanji letters, and some sound had as many as eight variants. The one in question is ‘no’, by the way. You can find typical ones here. Aha, those are the hentaigana! I did not think to consider them when I was trying to work it out, but I had covered them. It is such a common letter in older texts. While I remember, there’s an app for that. :-) Created by Osaka Uni. Comments at Typographica are moderated and copyedited, just like newspaper “Letters to the Editor”. Abusive or off-topic comments are not published. We appreciate compliments, but don’t publish them unless they add to the dialog. Thank you! Founded in 2002, Typographica is a review of typefaces and type books, with occasional commentary on fonts and typographic design. Edited by Stephen Coles with Caren Litherland and designed by Chris Hamamoto. Set in Pilot by Aleksandra Samuļenkova, Aglet Slab by Jesse Ragan, Guyot Text by Ramiro Espinoza, and Contemporary Sans by Ludwig Übele. Brought to you by this month’s nameplate sponsor, Fontspring, MyFonts, Wordpress, Fused, and the letter B. Read our editorial policy. Type at work in the real world. A book by Typographica editor Stephen Coles. Coles answers common questions about type. Lettering on vintage cars, appliances, and other objects. © 2019 Stephen Coles and each author as noted. All Rights Reserved.